You have a bog which you to monetize with Adsense or you want to monetize blog without adsense, in both situations I am here to help you. If you have a blog with lots of traffic and of good quality then you can make good money even without the most popular contextual ad network. If you are one of those who are looking for more ways or alternatives of Google Adsense to make money online, then you should read this post. Today I am going to share an awesome solution for you to make more money even with AdSense. The biggest challenge in the life of a professional blogger is to start with Affiliate marketing. If you are a blogger then you should know that affiliate marketing usually pay more than AdSense. One of the best solution that I am going to share with you is Cuelinks. The best part about Cuelinks is that it even compatible with AdSense. So you need not to leave AdSense ads while using Cuelinks. See : Should You Join Affiliate Marketplace or Direct Affiliate Program? Today I will share what all you need to know about Cuelinks. the first thing that you may ask is how to implement Cuelinks monetization on blog and how you start getting paid. Cuelinks is one of the quickest and easiest way to monetize blogs. You need not to do anything other than just setting up for first time. It will hardly take 5 minutes to setup Cuelinks for your blog after getting approval. Cuelinks is a one of the content monetization network which works same as skimlinks and Viglink. Posts automatically convert links to affiliate links of Indian merchant sites. You will get commission whenever any visitor click on that link and make purchase. So you see that Cuelinks makes affiliate marketing an easy to go process for you. By default, Cuelinks monetize all the merchant links. 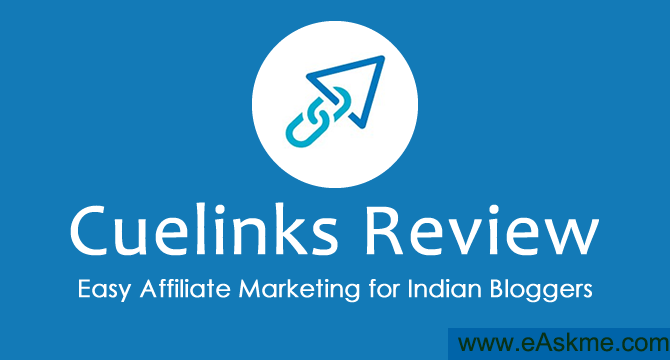 Cuelinks is great for any Indian bloggers whose target indian audience. and Over 600+ Indian Merchants. So you see it saves a lot of time that you have to spend to join individual merchants affiliate program. You can even generate direct affiliate links to the specific pages. Cuelinks deal widget is an awesome way to monetize your website or blog. This works great if you blog about exclusive offers and deals. It allows you to create widget with coupons to show in your blog sidebar. If you are linked to merchant sites then Cuelinks work great for you, but what if you have no direct link to merchant sites? Dont worry at this situation Cuewords come to help you. This is a new feature and it automatically converts your text into affiliate links. This quite useful for bloggers who are targeting Indian readers. Cuewords also ask you to choose how many words you want to convert on a page into affiliate links. I recommend you to keep it between 3-5 links, as too many links annoy readers. If you want to start a site of online deals and coupons, then Cuelinks also helps you there. You will get emails everyday in your inbox for on-going deals and you can start your online business with those deals. CouponPress is the best theme to start deal site.